The world of cycling in Wilmslow Cheshire lost one of its heroes with the passing of Dale Langham at the age of 56yrs . Dale was Chair of the the local cycle campaign group CycleWilmslow. 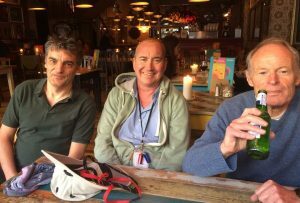 Over many years he worked tirelessly on behalf of all vulnerable road users, particularly cyclists, pedestrians and wheelchair users. 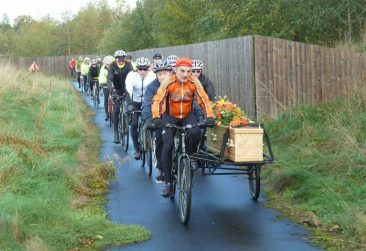 He passed away at his home among his family on 19th October. . At his request he was borne to his final resting place by cycle -hearse. Dale, a qualified electrical engineer, was a well respected member of the production team at Granada Televison. An accident effectively ended his working days at only 34. 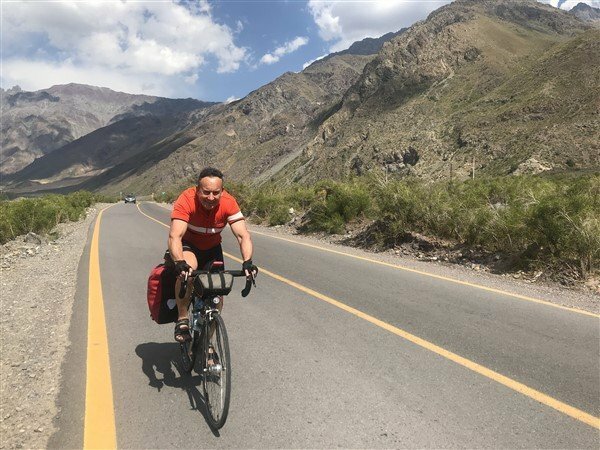 He took up cycling to aid his recovery. He went on to become for a number of years the local representative for Living Streets. and subsequently became Chair of CycleWilmslow. . Dale also supported the 20’s Plenty campaign and contributed to many local government consultative bodies. A leader who shunned the limelight. In a tribute at St Teresa’s Church , close friend of Dale, Rob Sawyer of CycleWilmslow said “Although Dale was modest and shunned the limelight, his achievements in this field were significant. With razor sharp intelligence, vision and powers of persuasion, he ensured that a number of facilities for walking and cycling came to fruition, including the Carrs Greenway, A556 cycling/walking improvements and a pelican crossing on Bedells Lane. Dale Langham – last tour in Chile. Dale enjoyed riding socially, with Macclesfield Wheelers and on CycleWilmslow’s family-friendly taster rides. He also took his children on epic cycling tours in Europe and further afield. Shortly after returning from one such expedition, to Chile, in February 2018 he was diagnosed with a life-limiting brain tumour. 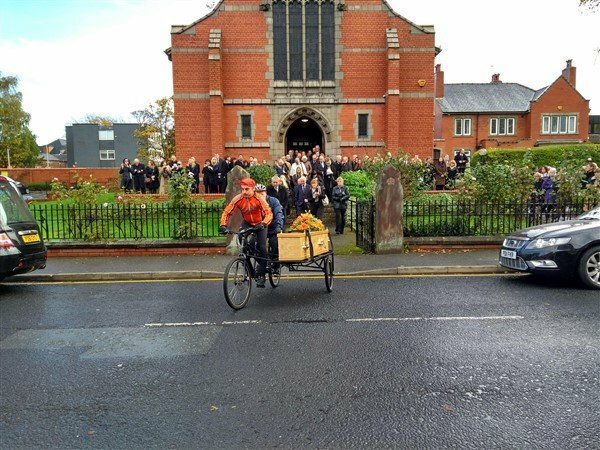 In accordance with his wishes, Dale made his final journey to Alderley Edge cemetery by bicycle hearse, accompanied by friends on two wheels. 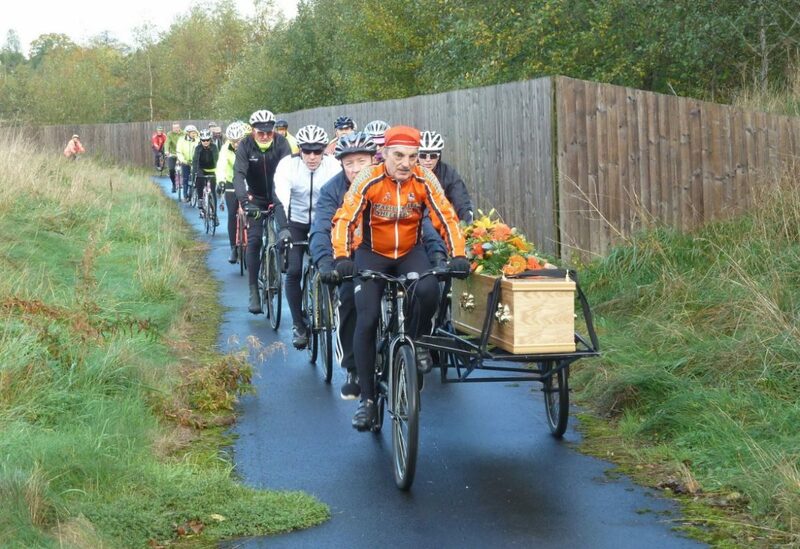 Rob added “It was fitting that the route taken included the shared-use path alongside the A34 Alderley Edge bypass – Dale was instrumental in getting this popular facility incorporated into the road scheme design.” Ironically in turning off the cycleway the cortege encountered bollards where the hearse and coffin needed to be lifted over by his friends, surely symbolic of the determination of cycle campaigners to overcome obstacles. CyclingUK‘s Local Representative,Matthias Bunte informing his colleagues of the sad loss wrote:- ‘Today Dale Langham was buried. A long standing campaigner from Wilmslow, In February Dale was cycling with his daughter in Chile. Upon returning home he was diagnosed with brain tumor and cancer. He died last week. I met Dale through CycleWilmslow. He was highly dedicated, straight talking, and witty. He also campaigned for walking, and air quality in Wilmslow. 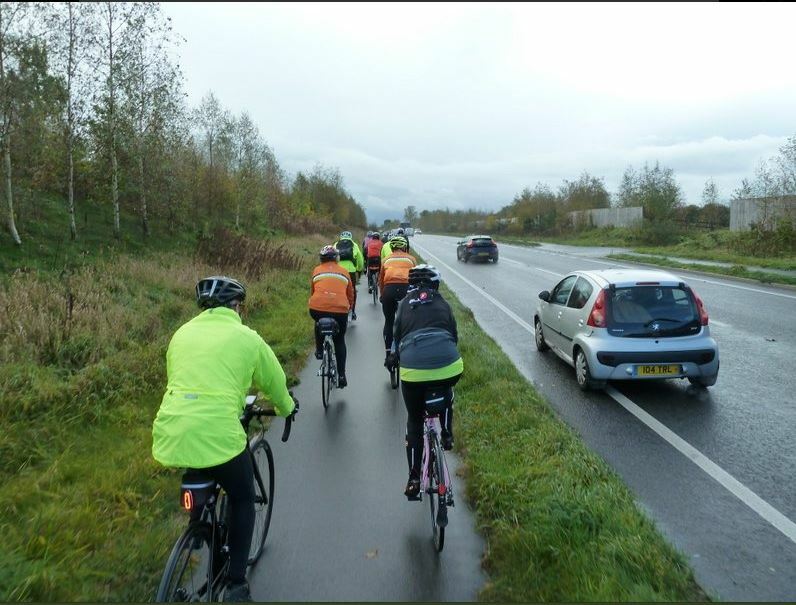 There was a moving eulogy by a friend and cycling companion of many years, mentioning the many happy rides they’d had together, in the UK and abroad. Dale’s final trip with friends in cycling.